Washington Post readers may have noticed something different when visiting the website in the last few days. The outlet has introduced a new mobile-first feature to provide context to its coverage of the 2016 presidential race. The feature, called Backdrop, went live on Monday. It's designed as a pop-up button in the lower-left-hand corner of all politics articles, and gives readers the option to access key background information about the campaign trail without having to leave the article page. 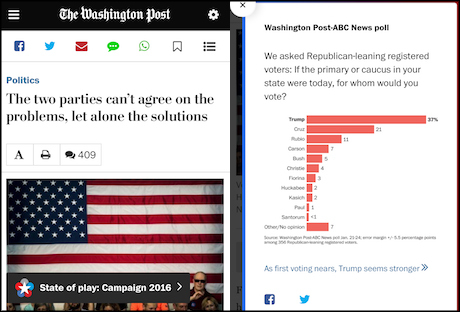 Terri Rupar, digital editor for national news at The Washington Post, said the idea originated from a conversation about helping people learn more about the campaign, but in a way that catered primarily to a mobile audience and smaller screens. "We had come up with a few ideas, but the problem with all of them was that it was really hard to translate them to mobile," she told Journalism.co.uk. "So we then decided to start with mobile and ask ourselves, '[how] we can add to our storytelling without just throwing stuff in the middle of a story that interrupts the reading experience'?" "For a lot of people, The Washington Post is really associated with politics and elections, so this is a good place for us to launch a feature like this." Backdrop will appear on an article as soon as the reader starts scrolling, both on desktop and mobile. When tapped or clicked, the button expands into a sliding panel, which takes up the whole screen on a smartphone. 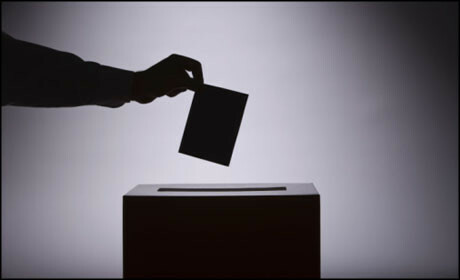 The information is displayed in bite-sized chunks, and will include data from election polls, video explainers, and key statistics or quotes from presidential candidates. When the reader has closed the pop-up window, the button will shrink and adopt a more faded colour to signal that all updates have been checked. If new context is added to a specific story, it will revert back to its original state. Each fact included in the background information has its own sharing options, so readers can post interesting poll results or quotes on Twitter and Facebook. Some of the content will be native to Backdrop, Rupar said, but some will also link to additional stories on The Washington Post website. Real time polling results will also be provided, starting with the upcoming Iowa caucuses on 1 February, although the aim is not to make the feature like a news feed or a replacement of the section front, she added. "This information is obviously very relevant when people are voting – they want to know what's going on, how many results are in, who's leading, but it's hard to provide that in every single article in a way that doesn't feel like it's interrupting. "So we wanted it to be a quick read, for people to be able to get through it with a couple of quick scrolls of their thumb." The context provided through Backdrop will be curated on a daily basis by Rupar and The Post's deputy digital editor for national, Allison Michaels. And if the news agenda requires it, they might also update the panel more than once a day. "There's some refreshing during the day, but I think that because we want this to provide context, there's no need to make it a loud, constantly updating newswire," Rupar said. The feature will be used until the end of the presidential campaign in November 2016, and if everything goes well, "we will always want to have that conversation" about expanding its use across other types of coverage in the future. "This is a feature that does feel really mobile-first, and I think it really shines on the mobile screen, where we have less space," said Rupar.